Trotting towards the lining of where the dry sands meets wet sand the white and gray horse came to a halt. Her eyes scanned the domain in silence, her ears forward and her head held high as she stood on the beach. Her long tail flicked back and forth, coming up to swat the pesky horseflies away as she stood there. Epona grunted as she watched the waves of the water rise and lower, they amazed her in a way that she couldn't understand. They intrigued her and made the white and gray female want to follow the crashing waters. The young mare watched in silence with her ears alert as she listened to the crashing waves against rocks. The young mare bobbed her head in excitement as a whinny escaped her muzzle when a large wave rose to the skies and then came crashing down to the earth sending Epona further back on dry sand. 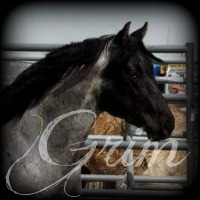 Grim stood back in the distance watching his mate, his stomach filled with butterflies every time he saw the beautiful gray and white mare. Giving a soft snicker, the stallion began to move towards her, his ears swiveling back and forth -an old habit of his. Every time he neared the mare, he felt his heart skip a beat. 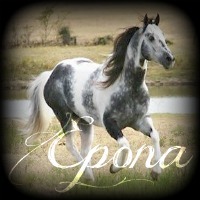 "Epona" he gave a soft whinny to announce his presence. The dual colored female neighed a welcoming to her mate. Her eyes shifted from the crashing waves to the dark faced stallion. "Hello," she said blinking her eyes gently, welcoming the male. She turned to face the stallion, her soft eyes watching his movements. The young female moved to meet him and gave Grim a gentle nip on the flank in greeting. The mare whinnied and flicked her ears in excitement. Such small things could excited the little white and gray female and seeing her mate was on of those things. Moments into their greeting Epona nibbled at her mates forelock in an effort to groom him affectionately. He snickered softly as he straightened out his neck, brushing his muzzle along your neck, nibbling at your mane with affection. Epona nickered at her mate and nuzzled the stallion back. Her dark hazel eyes watching the male as he pulled back. The mares ears flew back to her cranium as she watched her mate. "Everything okay?" 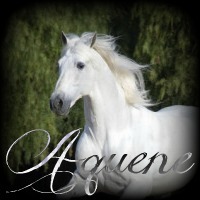 the gray and white horse asked Grim in a soft worried tone. She continued to watch him with a slightly tilted cranium. The Mares tail flicked up to her right flank as a horsefly landed on her side. She stepped forward and nuzzled her muzzle against Grims in a loving way. Grim's tail flicked side to side as a smile lit his face up. "Of course everything is okay" he nickered softly, brushing his muzzle in sync to your movements. Before nudging you "Care to take a walk with me love?" he neighed, pawing the ground with a single hoof. Epona smiled and gently took the stallions forelock between her teeth. She gave it a small tug before releasing the bit of mane and took of at a gallop down the beach, calling behind her. "I'll race you to the Blue Meadow!" she said with a giggle as she made her way towards the flowered meadow. One of the mare's favorite places to be. 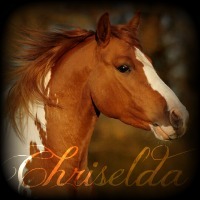 She kicked up sand as her hooves hit the soft debris on the ground. Rearing up, he let out a playful neigh and galloped after you, picking up speed until he was directly behind you. - he to loved the blue meadow, it was a good place to go if you were wishing to be alone or to be with the one you loved. Epona giggled and flicked her tail out of his reach. She pushed herself gently to gallop a little faster. 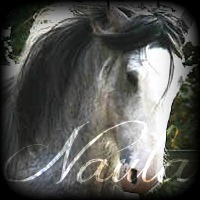 She was a playful girl, a happy one too and she loved her mate but she was very competitive which was easy to see. She whinnied in happiness and excitement as they raced their ways towards the Blue Meadow. The gray and white female soon slowed to a trot as they neared the Meadow, wanting to be beside the Lead Stallion of their herd. Your competiveness was just one thing he loved about you, so when he saw you speed up he snickered with laughter, tossing his head back with joy. upon seeing you slow your step, he to pulled back to a slow trot walking in sync to you, his side nearly brushing against yours.. Tilting his head to the side he bumped it up against your cheek. Sometime after meeting the loner called Killian, Gianna travelled further north. It was away from the volcano, a place of power, but it was towards a land that appeared occupied by a herd. Strength in numbers was another power this mare was quite accustomed to. She found herself on a beach with beautiful pure sands, just a few shades lighter than her own coat. Tiny grains churned beneath her hooves as the palomino trotted along, hugging the shadow of the cliffs. Her dark gaze alighted upon a sweet looking couple. It was possible they were the Leaders of the herd that occupied this land. An addition to their numbers was all she asked to be, but to find a very worthy and strong mate was what she expected to find here. The mare whinnied loudly and tossed her head once to alert them to her presence. 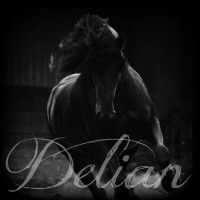 She pulled back, rearing slightly before lurching forward in a light canter to cover the distance that separated them. Eventually she slowed to a trot and then a walk, dipping her head respectfully as custom required. "Ser, madam. If it please you, I am Gianna. And I would eu with you in this herd." She knew they had to be the Leaders, for their scents were the only ones she had come across in this land that was occupied.